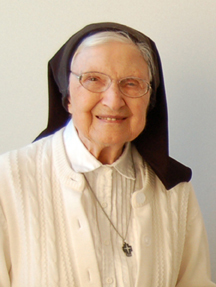 Sister Ralphine Fried, 97, a founding member of the Benedictine Sisters of Annunciation Monastery, Bismarck, entered eternal life Tuesday, June 7, 2011, at a Bismarck care center. Mass of Christian burial will be held at 10:30 a.m. Saturday, June 11 at the Chapel of Annunciation Monastery. Visitation starts at 3:00 p.m. Thursday at the monastery until the time of the funeral. A wake service is scheduled for 7:00 p.m. Friday, June 10 at the monastery. Sister Ralphine was born January 4, 1914, in Mandan, N.D., to Jacob and Eva (Aman) Fried and given the name, Margaret. When she became a sister, she changed her name to Ralphine, after her beloved brother, Ralph, who died very young. She is the seventh in a family of five girls and three boys. The family farmed and worked hard to care for and support five nieces and nephews who were orphaned during the difficult times of drought and depression. Sister Ralphine entered St. Benedict’s Monastery, St. Joseph, Minn., in 1935 and made monastic profession in 1937. When she had the opportunity to return to North Dakota, she transferred her religious commitment to the Sisters of Annunciation Monastery when they became an independent community in 1947. Sister Ralphine’s ministries always involved caring for others, whether it was through the wonderful food she cooked or in the attention she gave to her roles in housekeeping and laundry. She served in these capacities in Richmond, Minn.; Eau Claire, Wis., and was a cook at St. Mary’s Convent in Bismarck. She worked at St. Alexius Hospital for nine years and for two years at St. Benedict’s Home in Dickinson. She went on to serve as superior and administrator of St. Benedict’s for eleven years. In 1967, Sister Ralphine’s next healing ministry began at St. Joseph’s Hospital in Dickinson where she became a licensed practical nurse (LPN). She worked as an LPN at Garrison Hospital, Garrison; St. Vincent’s Nursing Home, Bismarck; and at Annunciation Monastery’s health center. Whenever time allowed, Sister Ralphine would pursue volunteer endeavors at St. Alexius. She was a firm believer in the Benedictine motto, “ora et labora,” which means “prayer and work,” and always looked for ways to serve others. Although Sister Ralphine saw many changes in religious life over the years, she welcomed the changes in recognizing, “It would be impossible to live religious life the way it used to be lived and engage in the ministries of today.” With God’s grace, she accepted her physical limitations. Sister Ralphine will be remembered for her gentle smile, peaceful spirit, her faithfulness to the Liturgy of the Hours, Eucharist and the rosary. She was always gracious and keenly interested in current events and activities of the monastic community. She lived with gratitude for all God had given her and she made it a priority to use her gifts to serve the poor through her beautiful crocheted baby blankets and afghans which she donated. She could often be seen in the early morning hours at her chair, serenely crocheting or making rosaries. This heartwarming presence will surely be missed. Her hand-strung rosaries traveled to missions around the world; it was her desire to help people pray and grow closer to God. Sister Ralphine had a deep love for children and was delighted by visits from her family members. She would eagerly await their arrival, making sure she had treats to offer them in true “Benedictine hospitality” style. Sister Ralphine is survived by her many extended family members and friends, and the Benedictine Sisters of Annunciation Monastery. She was preceded in death by her sisters: Sisters Clement and Lucilda, Odelia (Weber), Clementina (Regner) and her brothers, Joseph, Peter and Ralph. To share memories of Sister Ralphine, visit www.parkwayfuneral.com and sign the online guest book (Parkway Funeral Service, Bismarck). It is an understatement to say that Sister Ralphine is missed by all of us - and I do mean all of us - her monastic community, her family and all who knew and loved her. She was a precious woman - gentle, grateful and gracious. She loved us and we knew it. She prayed for us, was concerned for us and took an interest in all we did. Her ministries always involved caring for others whether it was cooking, doing the laundry, or making rosaries and crocheting baby blankets for the poor. Even up until a few months ago, she was often in chapel praying for others and rarely if ever missed Morning, Noon or Evening Prayer. It was a joy to be in her presence. With great fondness, we remember her engaging smile, her genuine care for us and her gratefulness for all we did for her. A part of us wishes that she still be here with us. Yes, we truly miss her. But even as we grieve the loss of Sister Ralphine's presence among us, we rejoice with her because she believed in Jesus' promise of life everlasting. Baptized into God's family, she followed Jesus in the way of love. As she believed so do we believe that she is raised with Him to a life that never ends. Not someday but now. We believe that now Sister Ralphine is seeing God face to face. This gentle woman is glowing in the warm embrace of God. The reading from Job reinforces this belief when he says, "I know that my Vindicator lives, and that he will at last stand forth upon the dust; Whom I myself shall see: my own eyes, not another’s shall behold him, and from my flesh I shall see God". How powerful these words are as we know of the struggle that Sister Ralphine had with her diminished eyesight during her lifetime. In the Church year, we are coming to end of the Easter season during which we celebrate Jesus' rising from the dead. He appeared to His disciples and told them to go and spread the Good News. He loved them and said he was going to prepare a place for them so that where Jesus is; those who follow Him would be too. We believe Sister Ralphine is in that heavenly kingdom, in the place in which Jesus prepared for her. We all know of the sufferings she experienced in her last days on earth. In a mysterious way, she shared in the sufferings of Christ and by doing so helped people throughout the world in a way she only now realizes. Like St. Paul in today's reading, Sister Raphine wanted to know Christ with all her heart and to know the power of His resurrection. She yearned for Christ, her heart's delight. Next summer would have been her 75th anniversary as a Benedictine sister. She spent 74 years seeking God with all her heart. She allowed herself to be molded into a person of love through the ups and downs of her life. She devoted herself to God and to God’s people. She was faithful - faithful to the end. To be sure, the day of her death was not the end. It was the beginning of a new and radiant life with God. St. Paul in his first letter to the Corinthians says no eye has seen, no ear has heard.... what God has prepared for those who love him. Sister Ralphine trusted completely in God’s love and care for her. She longed for this day and spoke freely about how she was ready to be with God. You could sense the peace and joy she had knowing that she would one day be with God forever. We pray for Sister Ralphine and we also ask God to help us to be ready to meet Jesus when he comes for us. Like Sister Ralphine may all of us know and trust in God’s love and care of us. Sister Ralphine, you now know what God has prepared for those who love Him. We can just imagine your face - radiant with joy with that precious smile of yours. You are saying to us. "Don't worry about me. I am happy. I am with God. There is nothing greater than that." Sister Ralphine, even though we miss you here, we know you will always be with us in spirit. We rejoice with you. Thank you for sharing your life with us. And we continue to rely on your prayers for us. I want to extend a sincere welcome to members of Sr. Ralphine's family, the Sisters of Annunciation Monastery, and friends who have gathered here this evening. Sermon on the Mount describe Sister Ralphine's spirit. She was a woman truly blessed with grace and favor before God. Who was Sr. Ralphine and what is it about her that calls us to celebrate her life this evening? Sr. Ralphine was surrounded by a loving family, a family to whom she was faithful and who were faithful to her. She enjoyed your frequent visits, and with true Benedictine hospitality always made sure she had a treat available for you. She enjoyed having the children come. I can hear her say with Jesus, "let the children come to me." Mt. 13:1 One of the things that Sr. Ralphine enjoyed was inviting her family out to share our cabin. In turn she engaged them in keeping our cabin in good shape. Yes, she loved to sit in the swing behind the cabin. It was one of her favorite places. She entered St. Benedict's Monastery, St. Joseph, Minnesota and made her first vows in 1937, almost 74 years ago. Her autobiography states that, although her two older sisters had entered monastic life, her decision was not especially influenced by their example. However, when she was a child, she dreamed that she was a Sister wearing a pink habit, not a black one. This might explain why she frequently wore her favorite pink sweater and why she is wearing a pink blouse now. Her religious life can be described in one word with many meanings, that word is faithfulness. Her faithfulness to the monastic life was expressed every day as she made her way to chapel to pray the Liturgy of the Hours-she never missed unless she was sick. Also many times she led the afternoon rosary for those in need. Her faithfulness to community life was expressed by attending community meetings and participating as much as she could. She balanced her life with personal and communal prayer, work, and community living. Her work consisted of cooking, gardening, housekeeping and laundry. She also served as the Administrator of St. Benedict's Home in Dickinson for 11 years. She embraced change with an open heart and mind. In 1967 she became an adult learner when at the age of 53 she obtained her GED and attended St. Joseph's Hospital Nursing Program in Dickinson and became a licensed practical nurse (LPN). After that she cared for elderly in nursing care facilities at Garrison Hospital, St. Vincent's Care Center and the Annunciation Monastery Health Center. More recently, her ministry consisted of crocheting blankets and afghans for the poor and making rosaries to be distributed throughout the world. As recently as this last semester she taught a University of Mary student how to make rosaries who in turn taught other students. So her ministry continues on. After we got through praying the rosary for her the night before she died, I reflected on the rosaries that she made and how those rosaries are prayed by people throughout the globe. Although she was retired she never retired from being of service to the poor. I can just imagine the many grateful hearts of those who are keeping warm with her blankets and afghans. Sr. Ralphine had an intense interest in what was happening around her. She would ask with great concern about what was happening in our sponsored institutions and always promised to pray for those who minister there. These last years had become more challenging for her. Her partial loss of eyesight and hearing became a trial for her, but she dealt with it well. I can imagine her praying with St. Peter in tonight's reading, "In this you rejoice, even if now for a little while you have had to suffer various trials, so that your faith, being more precious than gold, though perishable, is tested by fire, and may be found to result in praise and glory and honor when Jesus Christ is revealed." I Peter 6-7. We know by our faith that Sr. Ralphine lived a full spiritual life, and that when she died on June 7th she parked her walker outside Heaven's gates and entered. She took her proper place in her heavenly choir stall and started praising God, singing alleluias with full heart and voice with all the angels and saints, as she had for the last 97 years of her life. Sr. Ralphine may God embrace you with his eternal love and peace. Sr. Ralphine, pray for us as we do for you. We miss you.